Manifestations of different forms of the images find their visual expression in mediums like stone, metal, wood, terracotta or the sudhai (cement). The unique way of handling of these mediums needs the understanding and the proficiency of sastra, the theoretical knowledge and prayoga, the practical application. Śāstra (Text), Prayōga (application) and Sādhana (contemplation) are the three components of creation in Indian art. Ananda Coomaraswamy, an erudite scholar of Indian art has a special place and concern for an artist, architect or a craftsman in his profound writing. Wherever it warrants he explicitly writes the creative ability of an artist substantiated by his sādhana and perfect understanding of his tradition with reference to theory or śāstra[i] (Choodamani Nandagopal, Ananda Coomaraswamy’s Approach to Architectural Studies). There are similarities and resemblance of handling the medium and application of technique in most of the regions, which gave a feeling that a national approach existed amidst us in following the tradition of creating the art work. There are certain basic principles which are common to all art forms. They are content, balance, rhythm, symbolism, proportion, harmony, emotional expression and achieving the mastery over the medium. The content is seen as the subject matter or a theme in the art of painting, sculpture, in drama, music or dance. Content: The artist whether a painter or dancer or musician or a sculptor always thinks in image or picture form. He imagines the entire concept in a manner where he gets scope to beautifully present his imagination and content. The artist constantly thinks about the presentation that should be expressed in its best manner. Anadavardhana, a great Kashmir scholar in 9th century speaks about the dhvani, the inner meaning of the content which is the soul of expression and also about rasa–dhvani, the emotional meaning of the content in art. Thus content is the important aspect of the language in any art forms. Form: Form in art is concerned with the specific shape like square, triangle, cubic or the quality, which the artistic expression takes itself. Forms are related with media or medium that the artist uses to create an art work. The medium that is used often influences the form. For example, the form in a sculpture must exist in space in three-dimensions, and respond to gravity. Similarly Tajmahal appears great because of the medium, the marble; if it was built in other type of stone it would not have the visual quality and experience. Here the form is enhanced in space because it is white in colour and the marble could take the superb carving. Thus form is regarded as the soul of art without which art cannot be expressed at all. Balance: The language of each art has to have balance within many of the internal elements such as rhythm and content or form and content. While depicting the content the gestures, body postures and such other things are used with a sense of balance. Balancing of space, movements, tone, form constitute the compositional elements in the art of sculpture. Balance has to be the key factor to bring the artistic expression to rise to the level of quality in art. Symbolism: Art is expressed through symbolic bodily gestures or drawn images. The meaning of the content is narrated through hand gestures in dance, different types of gaits or costumes in drama, similarly the ragas in music evoke the time and moods and similarly the figures, motifs, postures, and colours have symbolic meanings in painting and sculpture. All these evolved with in the process of culture. For example, white or blue colours symbolise peace, certain ragas in music like Bhupali symbolises the early morning and sun rise, a single tree in the stage setting symbolises open air, a kalash, svastik, lotus motifs or as attributes symbolise the purity of thinking and deed. Emotional Expression: The emotions are the undercurrent to all expressive arts. Art loses its essence if emotions are not involved and infused. The different kinds of emotions are evoked depending on the character and theme in drama and dance. The navarasas – the nine types of emotional states are like the soul of artistic expression in all arts. They influence the viewers and convey messages and create artistic experience – the rasanubhava in both visual and performing arts. It reveals originality in artistic expression. The emotions in a good sculpture culminate in a contemplative mode and play on the nerves of a rasika as naturally as a flowing river or breeze. Proportion: Proportion is a principle which gives structure to art. Otherwise it is difficult to understand where to begin and where to end. If we do not think of a form in size and the order in which it should be brought into art, the expression in art creates confusion. In music it fixes the range of voice and its association with other instruments. The painter or sculptor has to think the size of the form that has to be brought out in relation to the size of the stone or a canvas. Thus the order of size and shape brings a structure where art is proportionately created. In art the size should not be too big or too small. The artistic values are comprehensive when art is proportionate in expression and not oversize presentations. Harmony: Each of the above principles discussed by itself, an independent element. If it is expressed without proper coordination with the other principles it will not create joy or delight in the onlookers. Required proportions, emotional qualities, compositional elements like form, content, balance and rhythm, when harmoniously treated the art will be delightful otherwise the experience can be chaotic. The insight of harmony eliminates the flaws and brings propriety to the artistic expression. Mastery over the medium: Art can be obtained through a sense of trained ability. It is also acquiring mastery over the medium. In sculpture it is the sense of three dimensional usage of stone, clay, metal or wood and the way these mediums are treated and handled. One thing is sure that the mastery over the medium is possible only with constant practice and improvisation. In other words it is the continuous evocation of Sastra, Prayoga and Sadhana. All great artists first perfect their basics and practice rigorously. There is no shortcut for acquiring great skills. Skill of execution was viewed as a quality inseparable from art and thus necessary for its success. The technique discussed below is basically used for stone carving. The medium of stone is very hard and of varied types such as sand stone, metallic stone, schist, granite etc ranging colours such as yellow, golden, greenish, red or pinkish, grey and buff shades. Selection of stone for creating sculpture is risky and tough job. The stones are quarried and brought to the site of carving. There are three types of stones such as masculine, feminine and neuter and an expert sthapathi will be in a position to identify by tapping and listening to the sound. The masculine type of stones is chosen for carving main images, when hit they produce a sound of metal or the hitting of a solid metal. The feminine give the sound of a stone used for the secondary types of images and the neuter are used for the lesser known or decorative units. Minute carvings and inlay work (fixing the required piece by carving the spot) are used in wood and ivory carvings. The techniques used for metal sculpture is entirely different. There are ten major categories of materials adopted by the Shilpi – stone, earth, wood, bronze or the combination of metals, sudhai (a special mortar like stucco, composite earth, brick, ivory, wax and colour pigments. The work methodology differs from material to material, but the inherent principles of rhythm and proportion are common to all[iv]. Engraving: The figures were carved on rocks in the beginning. Such line of carvings on the surface of the rock is known as etching or engraving. For example the engravings in the rock art phase belong to this category and it is known as graffiti in present. 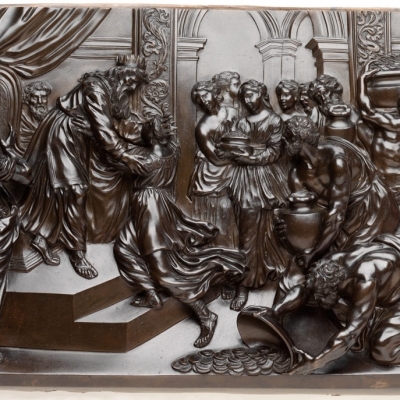 Low relief: Compared to etchings the low relief sculptures are deeply carved. The images and motifs appear as the embossed ones. The stories of the epics (Hindu) and jataka (Buddhist) stories were created in low-relief technique. For example the narrative panels from Buddhist chaityas such as Sanchi and Barhut are in low relief and also early narratives of Indian epics. High relief: The high relief sculptures are much deeply carved than the low-relief sculptures. These sculptures create the illusion of movement. Such high reliefs are seen on the wall of many temple architecture such as Pattadakal narratives on the pillars. Bas-relief: The figures are emerged out of the wall but the rear portion of the figure cannot be seen. The sculptures in the rock-cut architecture such as Badami, Aihole, Mahabalipuram, Ellora, Ajanta, Elephanta are the examples of bas-relief which have the emerging impact. Images in-the-round: The sculptures that are seen all round belong to this category. Entire stone is carved in the form of image for the purpose of worship or carved on the stone slab to place it in the required positions of the temple units. For example the images worshipped in the garbhagriha of the temple are carved in round, free-standing style. Stencil style: Carving on temples has one more style, called ‘stencil style’. In this technique the entire surface remains plain but the cutting of figures and designs is done deep into stone. The carvings on the shikharas (the tower) of the Hindu temples are done in this style. Later we find abundant use of this technique in Islamic art. Metal sculptures: Metal facilitates very skillful, delicate workmanship, and is also capable of representing the image in all its beauty and intricacy. Since utsava, the processional images need to be shifted from place to place, the use of metal in such cases becomes indispensable [v]. Such images are popularly identified as bronzes. This is an important branch of Indian sculpture. The art of metal casting always received great attention and is of the highest antiquity. The metal sculptures are found even in Indus valley period dated around 3000 BCE. Later the bronze sculptures of Buddha were created during the hey days of Nalanda and followed in Pallava, Chola and Vijayanagar times. There are two basic techniques in metal casting. i). The image is conceived and modeled first using only wax. the model looks like a clay image with an opening at the top and bottom. iv) It should be allowed to cool down. decorations and finally polishing the image. The sculpture of dancing girl from Indus Valley is the earliest reference of metal sculpture in India. Large number of metal sculptures are found in the archaeological excavations in all historical periods. But the finest examples are the Nataraja sculptures from the Chola period. with all the details and then pouring the liquid metal thinly all over the model. sculptures come from many folk traditions. By applying these methods depending on the type of image and medium, the sthapathi decides the process of creating the images and icons. He is supposed to have his special types of tools like chisels, hammers and saws of different sizes. Though they look like ordinary tools by appearance, when it comes in the hands of a sthapathi they transform into an extra-ordinary set of apparatus most valued and sought after to use in the manifestation of divine forms.